Do you know what day is historically the busiest day of the year in animal shelters all across the country? It’s the FIFTH of July. The stress and anxiety that fireworks create in many cats and dogs. The lack of awareness and/or understanding of #1 (above) on the part of the general public – pet owners and non-pet people, alike. The failure of thousands of pet owners to take the easy steps necessary to minimize their pet’s stress and anxiety, prevent their pet’s escape from their home, yard, or leash, and to maximize the chances that they will be reunited with a lost pet. Very few lost pets make it home again. Never have dogs off leash around July 4 and never take pets to fireworks displays. Microchip all pets, even indoor-only cats to help ensure any lost pets have a better chance at returning home. According to the ASPCA, the National Council on Pet Population Study and Policy estimates that fewer than 2% of cats and only 15-20% of dogs entering shelters are ever reunited with their families! These are sad and tragic statistics, wouldn’t you agree? Seeing as how such a paltry number of pets winding up in shelters ever make it back to their home, the importance of taking steps to prevent them from needing to be there in the first place truly cannot be overstated. And for those who do wind up in shelters, nor can the importance of taking steps to increase the chances that they will be reunited with you. These easy and important steps and tips are outlined below. Have a read and don’t forget to share with your friends, family, neighbors, and coworkers – I’m sure they’d like to keep their pets safe, too. Talk with your veterinarian well in advance of July 4th if sedatives are going to be necessary to help your pet through the fireworks. Be sure to do a “test dose” prior to the 4th to determine the dose and frequency that will be the safest and most effective for your pet. Consider using pheromones, such as Feliway (for cats) or Dog Appeasing Pheromone (DAP, for dogs), or the Thundershirt for additional help with anxiety. If stress and anxiety are problems for your cats or dogs throughout the year, talk to your veterinarian about working with a veterinary behaviorist. You can find a link to locate veterinary behavior specialists on our Pet Behavior and Training Resources page. Keep all cats and dogs indoors on and around the 4th of July. You never know when the fireworks displays will begin or end – they often start a few days before and extend several days beyond. Keep all windows and doors securely closed. Block off all pet doors and ensure that all yard gates are intact and securely closed. Provide your pets with a safe, quiet, and secure area within the house. This might be their crates or a small room. Be sure they have fresh water and some of their favorite toys with them. For cats, be sure to provide clean litter boxes in this area, too. Never have your pets around you when setting off fireworks in your yard and never take your dog with you to your neighborhood or town fireworks display. This won’t only keep your pets from getting scared and “bolting,” it will also avoid the burn injuries that dogs commonly get from chasing and trying to catch or eat fireworks! You never know when an impromptu fireworks display is going to happen. It’s safest to take a “Murphy’s Law approach” and just assume that one will every time you take your dogs out on or around the 4th of July. Be sure that your dog is leashed up every time they leave your house. Be sure to attach the leash before you open the door! Be sure that the leash is securely attached to a well-fitted and sturdy collar or harness. Many dogs have, in a fit of anxiety, wriggled their way out of collars and harnesses that were too loosely fitted. Don’t let your pup be one of them. Never just let your dog out in the yard to “do their business” on or around the 4th of July – regardless of whether your yard is fenced or not. Dogs have been known to jump several feet over fences or burrow under them to escape their yard, and you never know when someone has made it easy for your dog by leaving a fence gate open. Always leash dogs up at this time of year. Microchips are important, for all pets (even indoor-only cats). Speak with your veterinarian about having it done – the only time it’s too late is once a pet has already disappeared. Make sure to register the chip and keep your contact information up-to-date. The QR code ID tag by PetHub is an excellent means of identifying your pets. The tag comes with a personalized webpage for your pets and the QR code enables anybody with a smartphone to scan your lost pet. This technology greatly increases the chances of your lost pet being reunited with you. Always have recent photos of your pets handy. After all, a picture speaks a thousand words and can likely do a better job of identifying your pet than any verbal description you can muster up. Contact your microchip company and tag company. If you have the PetHub tag, be sure to ensure that the information on your pet’s personal webpage is up-to-date. Enroll your neighbors to keep an eye open for your missing pet in the neighborhood. Contact all veterinary clinics and hospitals in your area. Don’t forget about your local pet emergency hospitals. Contact your local animal shelters and monitor their websites (many shelters will update their website with found pets). Be sure to call and check their website every day – but be patient with them, they are sure to be overloaded with enquiries and pets needing care. 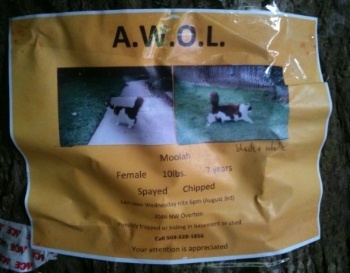 Plaster your neighborhood and town with Lost Pet posters – be sure to include a photo and any of your pet’s distinguishing features. Also be sure to include a way for people to get in touch with you! Post a “lost pet notice” on Craigslist and check back daily. Take the simple steps highlighted above and not only will you minimize the likelihood that your pets will be among the thousands of pets entering a shelter this year on July 5th, but you’ll also greatly increase the chances that you’ll be reunited with them if they do. Have a safe and wonderful 4th (and a stress-free 5th)! *Note that much of the advice laid out in this blog post isn’t exclusive to fireworks associated with the 4th of July, or even to pets in the USA. It also applies to preventing lost pets from fireworks on and around New Year’s Eve, Canada Day, Guy Fawkes Day, and any other celebration punctuated by fireworks displays – as well as helping to protect pets who get lost as a result of thunder and other noise phobias.